As a leading organization in the Charlotte international community, International House has been invited to participate in the City of Charlotte’s newly created Immigrant Integration Task Force. Created by City Council resolution in November, the Task Force is intended to be an inter-agency effort that will evaluate and recommend ways to maximize immigrants’ economic and civic contributions to Charlotte. We are very pleased to be included in this initiative along with other community stakeholders who are representative of the diversity of people living and working in the Queen City. The Task Force will soon begin a research and discovery process that will be used to craft recommendations for creating City services and partnerships that will help immigrants better integrate into the community. The Task Force will also make recommendations regarding the creation of opportunities for economic and civic contributions of immigrants. Jennifer Watson Roberts, President of International House’s Board of Directors, will be our official representative to the Task Force. We applaud the members of the City Council, former Mayor Patsy Kinsey, and Mayor Patrick Cannon for their leadership in creating this Task Force and recognizing the need for new momentum in discerning the role that the City can play in providing a framework for Charlotte’s immigrant populations to help expand our local economy and enrich civic life. Here at International House, we have seen first-hand the many contributions that Charlotte’s newest citizens are making to our community. Charlotte’s foreign-born population has increased dramatically from 23,000 in 1990 to over 173,000 residents in 2011. 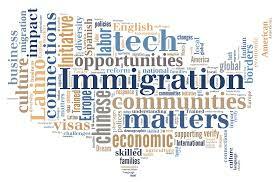 This means that immigrants of all skill levels are active participants in Charlotte’s economy. It also means that finding ways to assist immigrants in better integrating into Charlotte’s neighborhoods, education system, industries and businesses benefits everyone. We are proud to contribute to this new initiative that will help Charlotte continue to be a globally competitive city with a colorful mix of neighbors building a healthy community for all! This entry was posted in From the Executive Director and tagged Charlotte North Carolina, denise long, Immigration, international house by ihcharlotte. Bookmark the permalink.